It appears that when free agency begins next month on July 5th, Mark Streit will test the market for the best possible deal. The story, which was originally broke by Newsday’s Arthur Staple, claims that multiple sources have confirmed that the current Islanders’ captain and the organization will not look to construct a future contract. According the Staple, Streit turned down the team’s top offer, a 5 million per season deal that would top the dollar amount given this year to fellow blue liner Lubomir Visnovsky. The deal put on the table by the organization was for 3 years. It is believed that Streit is looking for a multiyear deal upwards of 5.5 per season. Based on this year’s crop of free agent defenseman, it’s fair to say that Streit will be viewed as the top free agent D man, and a 4 year/5.75 million contract is obtainable. This could very well be thought of as over paying for a player on the back end of his career, but the market has shown that GM’s will pay for defenseman that can produce offense. When the Swiss native signed with the Isles in 2008, it was a turning point for both he and the organization. Streit was a late bloomer who didn’t seem to be in the future plans of the Montreal Canadiens, and the 2008-09 Islander roster was shaping up around declining players like Bill Guerin and Doug Weight. 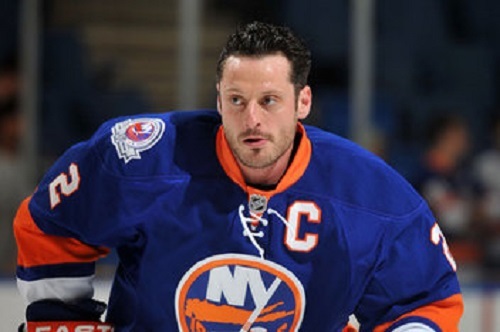 Mark Streit’s contract was the first long term long deal that would have a significant impact on the New York Islanders under Garth Snow. Prior to this point, Long Island was not a hot landing spot for big time free agents. This is a problem that continues to hinder the progress of the team. There are numerous factors that account for this situation. Terrible facility, lack of team spending, losing product on the ice: all have been plaguing an organization that has had to settle for second rate signings such as Mike Comrie. Mark Streit was the first legitimate player to commit to the island, and it will be bittersweet to see the captain leave. It’s hard to begrudge any side in this situation. Mark Streit has been nothing short of a true professional, both on and off the ice, for the 5 years he has been with the organization. He may not have been the most vocal of captains, but there was never a moment where you were ashamed to have Mark Streit as your captain. As for GM Garth Snow, this is the wise decision. As good as Streit has been over his tenure, he has a lot going against him this offseason. The D man will be turning 36 this December, and his lack of foot speed was very apparent this post season. Quite frankly, Mark Streit has become a defensive liability. He’s never had a glowing plus/minus during his career, but the -27 & -14 numbers he’s posted over the last two seasons respectively is a good indicator of where his game is headed. Once Lubomir Visnovsky was signed this past season to a 2 year deal, Mark Streit became expendable. The fact that the Visnovsky-Hickey pairing was arguably the team’s best duo down the stretch was just the final nail in the coffin. Even though there will be numerous team’s around the league this July willing to court Streit and his wants, I’m sure the majority of GM’s would agree with the decision Snow is making. The other major factor that’s going against Mark Streit returning to the island is the presence of John Tavares. It’s no secret that J.T. has been the captain in waiting. It simply would not make sense to give the “C” to Streit for another 3 years with everyone just waiting to gobble up all those Johnny jersey’s with the “C” on it! Since being drafted by the team in 09, Tavares and Streit have gained a close bond. During this past lockout, Tavares joined Streit to play in his hometown of Bern. I can’t think of a more natural time for this inevitable “passing of the torch” to happen. All in all, this is a win-win for both sides. Mark Streit will receive a contract he is due (and then some), and the Islanders will continue to stick to the game plan. Grow talent from within and make the occasional, calculated splash into free agency. I think most Islander fans would be proud that Mark Streit was the rebuild’s first splash.